A camcorder is an electronic device originally combining a video camera and a videocassette recorder. The earliest camcorders were tape-based, recording analog signals onto videotape cassettes. In 2006, digital recording became the norm, with tape replaced by storage media such as mini-HD, microDVD, internal flash memory and SD cards. More recent devices capable of recording video are camera phones and digital cameras primarily intended for still pictures; the term "camcorder" may be used to describe a portable, self-contained device, with video capture and recording its primary function, often having advanced functions over more common cameras. Prior to the camcorder, a portable recorder and camera would be required. This is a Sony SL-F1 Betamax recorder and video camera. Video cameras originally designed for television broadcast were large and heavy, mounted on special pedestals and wired to remote recorders in separate rooms. As technology improved, out-of-studio video recording was possible with compact video cameras and portable video recorders; a detachable recording unit could be carried to a shooting location. Although the camera itself was compact, the need for a separate recorder made on-location shooting a two-person job. Specialized videocassette recorders were introduced by JVC (VHS) and Sony (U-matic, with Betamax) releasing a model for mobile work. Portable recorders meant that recorded video footage could be aired on the early-evening news, since it was no longer necessary to develop film. In 1983, Sony released the first camcorder, the Betacam system, for professional use. A key component was a single camera-recorder unit, eliminating a cable between the camera and recorder and increasing the camera operator's freedom. The Betacam used the same cassette format (0.5 inches or 1.3 centimetres tape) as the Betamax, but with a different, incompatible recording format. It became standard equipment for broadcast news. Sony released the first consumer camcorder in 1983, the Betamovie BMC-100P. It used a Betamax cassette and rested on the operator's shoulder, due to a design not permitting a single-handed grip. That year, JVC released the first VHS-C camcorder. Kodak announced a new camcorder format in 1984, the 8 mm video format. Sony introduced its compact 8 mm Video8 format in 1985. That year, Panasonic, RCA and Hitachi began producing camcorders using a full-size VHS cassette with a three-hour capacity. These shoulder-mount camcorders were used by videophiles, industrial videographers and college TV studios. Full-size Super-VHS (S-VHS) camcorders were released in 1987, providing an inexpensive way to collect news segments or other videographies. Sony upgraded Video8, releasing the Hi8 in competition with S-VHS. Digital technology emerged with the Sony D1, a device which recorded uncompressed data and required a large amount of bandwidth for its time. In 1992 Ampex introduced DCT, the first digital video format with data compression using the discrete cosine transform algorithm present in most commercial digital video formats. In 1995 Sony, JVC, Panasonic and other video-camera manufacturers launched DV, which became a de facto standard for home video production, independent filmmaking and citizen journalism. That year, Ikegami introduced Editcam (the first tapeless video recording system). Camcorders using DVD media were popular at the turn of the 21st century due to the convenience of being able to drop a disc into the family DVD player; however, DVD capability, due to the limitations of the format, is largely limited to consumer-level equipment targeted at people who are not likely to spend any great amount of effort video editing their video footage. Panasonic launched DVCPRO HD in 2000, expanding the DV codec to support high definition (HD). The format was intended for professional camcorders, and used full-size DVCPRO cassettes. In 2003 Sony, JVC, Canon and Sharp introduced HDV as the first affordable HD video format, due to its use of inexpensive MiniDV cassettes. Sony introduced the XDCAM tapeless video format in 2003, introducing the Professional Disc (PFD). Panasonic followed in 2004 with its P2 solid state memory cards as a recording medium for DVCPRO-HD video. In 2006 Panasonic and Sony introduced AVCHD as an inexpensive, tapeless, high-definition video format. AVCHD camcorders are produced by Sony, Panasonic, Canon, JVC and Hitachi. About this time, some consumer grade camcorders with hard disk and/or memory card recording used MOD and TOD file formats, accessible by USB from a PC. In 2010, after the success of James Cameron's 2009 3D film Avatar, full 1080p HD 3D camcorders entered the market. With the proliferation of file-based digital formats, the relationship between recording media and recording format has declined; video can be recorded onto different media. With tapeless formats, recording media are storage for digital files. In 2011 Panasonic released a camcorder capable of shooting in 3D, the HDC-SDT750. It is a 2D camcorder which can shoot in HD; 3D is achieved by a detachable conversion lens. Sony released a 3D camcorder, the HDR-TD10. The Sony's 3D lens is built in, but it can shoot 2D video. Panasonic has also released 2D camcorders with an optional 3D conversion lens. The HDC-SD90, HDC-SD900, HDC-TM900 and HDC-HS900 are sold as "3D-ready": 2D camcorders, with optional 3D capability at a later date. In CES (January) 2014, Sony announced the first consumer/low-end professional ("prosumer") camcorder Sony FDR-AX100 with a 1" 20.9MP sensor able to shoot 4K video in 3840x2160 pixels 30fps or 24fps in the XAVC-S format; in standard HD the camcorder can also deliver 60fps. When using the traditional format AVCHD, the camcorder supports 5.1 surround sound from its built-in microphone, this is however not supported in the XAVC-S format. The camera also has a 3-step ND filter switch for maintaining a shallow depth of field or a softer appearance to motion. For one hour video shooting in 4K the camera needs about 32 GB to accommodate a data transfer rate of 50 Mbit/s. The camera's MSRP in the US is USD $2,000. In early 2014 Sony released the FDR-AX100 which represents the next generation of camcorders. It is capable of shooting in 4K resolution. It currently has a price tag of £1,699 and 4K camcorders are not expected to come into the mainstream market for at least another eight to ten years as most current Blu-ray players are not capable of playing 4K video. Virtually all mainstream TVs are not 4K ready either with the only 4K TVs available being very expensive at £2,500 or over. The only means of archiving 4K video is the 100 GB Blu-ray Disc XL but the discs are very expensive. However, in 2015, consumer UHD (3840x2160) camcorders below USD $1000 have become available. Sony released the FDRAX33, and Panasonic has released the HC-WX970K and the HC-VX870. In September 2014 Panasonic announced and claimed 4K Ultra HD Camcorder HC-X1000E as the first conventional camcorder design that can capture up to 60fps at 150 Mbit/s or alternatively standard HD recording at up to 200 Mbit/s in ALL-I mode with MP4, MOV and AVCHD formats all offered depending on the resolution and frame rate. With use 1/2.3" small sensor as commonly is used by bridge cameras, the camcorder has 20x optical zoom in a compact body with dual XLR audio inputs, Internal ND filters and separate control rings for focus, iris and zoom. In HD capture, the camcorder get benefit to reduce noises of small sensor by in-camera downscaling of the 4K image to HD. As of January 2017, the only major manufacturer to announce new consumer camcorders at CES (Consumer Electronic Show) in Las Vegas was Canon with its entry-level HD models. Panasonic only announced details regarding their Mirrorless Micro Four Thirds Digital Camera called the LUMIX GH5, capable of shooting 4K in 60p. This is the first time in decades that Panasonic & Sony haven't announced new traditional camcorders at CES, & instead carried over 2016's models, such as Sony's FDR-AX53. This is due to there being far less demand in the market for traditional camcorders as more & more consumers prefer to record video with their 4K-capable smartphones, DSLRs, and action cameras from GoPro, Xiaomi, Sony, Nikon, and many others. Camcorders have three major components: lens, imager and recorder. The lens gathers light, focusing it on the imager. The imager (usually a CCD or CMOS sensor; earlier models used vidicon tubes) converts incident light into an electrical signal. The recorder converts the electrical signal to video, encoding it in a storable form. The lens and imager comprise the "camera" section. In consumer units these adjustments are often automatically controlled by the camcorder, but can be adjusted manually if desired. Professional-grade units offer user control of all major optical functions. The imager, often a CCD, or a photodiode array which may be an Active Pixel Sensor, converts light into an electrical signal. The camera lens projects an image onto the imager surface, exposing the photosensitive array to light. This light exposure is converted into an electrical charge. At the end of the timed exposure, the imager converts the accumulated charge into a continuous analog voltage at the imager's output terminals. After the conversion is complete, the photosites reset to start the exposure of the next video frame. In many cases the photosites (per pixel) are actually reset globally by charging to a fixed voltage, and discharged towards zero individually proportionally to the accumulated light, because it is simpler to manufacture the sensor that way. Most camcorders use a single imaging sensor with integrated colour filters, per pixel, to enable red, green and blue to be sensed, each on their own set of pixels. The individual pixel filters present a significant manufacturing challenge. However some camcorders, even consumer grade devices such as the JVC GZ-HD3, introduced around 2007, are triple sensor cameras, usually CCD but could be CMOS. In this case the exact alignment of the three sensors so that the red, green and blue components of the video output are correctly aligned, is the manufacturing challenge. The recorder writes the video signal onto a recording medium, such as magnetic videotape. Since the record function involves many signal-processing steps, some distortion and noise historically appeared on the stored video; playback of the stored signal did not have the exact characteristics and detail as a live video feed. All camcorders have a recorder-controlling section, allowing the user to switch the recorder into playback mode for reviewing recorded footage, and an image-control section controlling exposure, focus and color balance. The image recorded need not be limited to what appeared in the viewfinder. For documenting events (as in law enforcement), the field of view overlays the time and date of the recording along the top and bottom of the image. The police car or constable badge number to which the recorder was given, the car's speed at the time of recording, compass direction and geographical coordinates may also be seen. An RCA AutoShot VHS Camcorder. It can only record up to four hours of NTSC analog video. Camcorders are often classified by their storage device; VHS, VHS-C, Betamax, Video8 are examples of late 20th century videotape-based camcorders which record video in analog form. Digital video camcorder formats include Digital8, MiniDV, DVD, hard disk drive, direct to disk recording and solid-state, semiconductor flash memory. While all these formats record video in digital form, Digital8, MiniDV, DVD and hard-disk drives have no longer been manufactured in consumer camcorders since 2006. In the earliest analog camcorders the imaging device is vacuum-tube technology, in which the charge of a light-sensitive target was directly proportional to the amount of light striking it; the Vidicon is an example of such an imaging tube. Newer analog, and digital camcorders use a solid-state charge-coupled imaging device (CCD) or a CMOS imager. Both are analog detectors, using photodiodes to pass a current proportional to the light striking them. The current is then digitised before being electronically scanned and fed to the imager's output. The main difference between the two devices is how the scanning is done. In the CCD the diodes are sampled simultaneously, and the scan passes the digitised data from one register to the next. In CMOS devices, the diodes are sampled directly by the scanning logic. Digital video storage retains higher-quality video than analog storage, especially on the prosumer and strictly consumer levels. MiniDV storage allows full-resolution video (720x576 for PAL, 720x480 for NTSC), unlike analog consumer-video standards. Digital video does not experience colour bleeding, jitter, or fade. Unlike analog formats, digital formats do not experience generation loss during dubbing; however, they are more prone to complete loss. Although digital information can theoretically be stored indefinitely without deterioration, some digital formats (like MiniDV) place tracks only about 10 micrometers apart (compared with 19–58 μm for VHS). A digital recording is more vulnerable to wrinkles or stretches in the tape which could erase data, but tracking and error-correction code on the tape compensates for most defects. On analog media, similar damage registers as "noise" in the video, leaving a deteriorated (but watchable) video. DVDs may develop DVD rot, losing large chunks of data. An analog recording may be "usable" after its storage media deteriorates severely, but slight media degradation in digital recordings may trigger an "all or nothing" failure; the digital recording will be unplayable without extensive restoration. Older digital camcorders record video onto tape digitally, microdrives, hard drives, and small DVD-RAM or DVD-Rs. Newer machines since 2006 record video onto flash memory devices and internal solid-state drives in MPEG-1, MPEG-2 or MPEG-4 format. Because these codecs use inter-frame compression, frame-specific editing requires frame regeneration, additional processing and may lose picture information. Codecs storing each frame individually, easing frame-specific scene editing, are common in professional use. Other digital consumer camcorders record in DV or HDV format on tape, transferring content over FireWire or USB 2.0 to a computer where large files (for DV, 1GB for 4 to 4.6 minutes in PAL/NTSC resolutions) can be edited, converted and recorded back to tape. The transfer is done in real time, so the transfer of a 60-minute tape requires one hour to transfer and about 13GB of disk space for the raw footage (plus space for rendered files and other media). A tapeless camcorder is a camcorder that does not use video tape for the digital recording of video productions as 20th century ones did. Tapeless camcorders record video as digital computer files onto data storage devices such as optical discs, hard disk drives and solid-state flash memory cards. Inexpensive pocket video cameras use flash memory cards, while some more expensive camcorders use solid-state drives or SSD; similar flash technology is used on semi-pro and high-end professional video cameras for ultrafast transfer of high-definition television (HDTV) content. Most consumer-level tapeless camcorders use MPEG-2, MPEG-4 or its derivatives as video coding formats. They are normally capable of still-image capture to JPEG format additionally. Consumer-grade tapeless camcorders include a USB port to transfer video onto a computer. Professional models include other options like Serial digital interface (SDI) or HDMI. Some tapeless camcorders are equipped with a Firewire (IEEE-1394) port to ensure compatibility with magnetic tape-based DV and HDV formats. Since the consumer market favors ease of use, portability and price, most consumer-grade camcorders emphasize handling and automation over audio and video performance. Most devices with camcorder capability are camera phones or compact digital cameras, in which video is a secondary capability. Some pocket cameras, mobile phones and camcorders are shock-, dust- and waterproof. This market has followed an evolutionary path driven by miniaturization and cost reduction enabled by progress in design and manufacture. Miniaturization reduces the imager's ability to gather light; designers have balanced improvements in sensor sensitivity with size reduction, shrinking the camera imager and optics while maintaining relatively noise-free video in daylight. Indoor or dim-light shooting is generally noisy, and in such conditions artificial lighting is recommended. Mechanical controls cannot shrink below a certain size, and manual camera operation has given way to camera-controlled automation for every shooting parameter (including focus, aperture, shutter speed and color balance). The few models with manual override are menu-driven. Outputs include USB 2.0, Composite and S-Video and IEEE 1394/Firewire (for MiniDV models). The high end of the consumer market emphasizes user control and advanced shooting modes. More-expensive consumer camcorders offer manual exposure control, HDMI output and external audio input, progressive-scan frame rates (24fps, 25fps, 30fps) and higher-quality lenses than basic models. To maximize low-light capability, color reproduction and frame resolution, multi-CCD/CMOS camcorders mimic the 3-element imager design of professional equipment. Field tests have shown that most consumer camcorders (regardless of price) produce noisy video in low light. Before the 21st century, video editing required two recorders and a desktop video workstation to control them. A typical home personal computer can hold several hours of standard-definition video, and is fast enough to edit footage without additional upgrades. Most consumer camcorders are sold with basic video editing software, so users can create their own DVDs or share edited footage online. Since 2006, nearly all camcorders sold are digital. Tape-based (MiniDV/HDV) camcorders are no longer popular, since tapeless models (with an SD card or internal SSD) cost almost the same but offer greater convenience; video captured on an SD card can be transferred to a computer faster than digital tape. 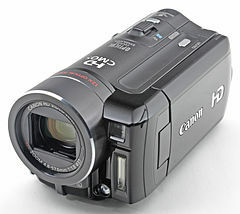 None of the consumer-class camcorders announced at the 2006 International Consumer Electronics Show recorded on tape. Video-capture capability is not confined to camcorders. Cellphones, digital single-lens reflex and compact digicams, laptops and personal media players offer video-capture capability, but most multipurpose devices offer less video-capture functionality than an equivalent camcorder. Most lack manual adjustments, audio input, autofocus and zoom. Few capture in standard TV-video formats (480p60, 720p60, 1080i30), recording in either non-TV resolutions (320x240, 640x480) or slower frame rates (15 or 30 fps). A multipurpose device used as a camcorder offers inferior handling, audio and video performance, which limits its utility for extended or adverse shooting situations. The camera phone developed video capability during the early 21st century, reducing sales of low-end camcorders. DSLR cameras with high-definition video were also introduced early in the 21st century. Although they still have the handling and usability deficiencies of other multipurpose devices, HDSLR video offers the shallow depth-of-field and interchangeable lenses lacking in consumer camcorders. Professional video cameras with these capabilities are more expensive than the most expensive video-capable DSLR. In video applications where the DSLR's operational deficiencies can be mitigated, DSLRs such as the Canon 5D Mark II provide depth-of-field and optical-perspective control. Combo-cameras combine full-feature still cameras and camcorders in a single unit. The Sanyo Xacti HD1 was the first such unit, combining the features of a 5.1 megapixel still camera with a 720p video recorder with improved handling and utility. Canon and Sony have introduced camcorders with still-photo performance approaching that of a digicam, and Panasonic has introduced a DSLR body with video features approaching that of a camcorder. Hitachi has introduced the DZHV 584E/EW, with 1080p resolution and a touch screen. The Flip Video was a series of tapeless camcorders introduced by Pure Digital Technologies in 2006. Slightly larger than a smartphone, the Flip Video was a basic camcorder with record, zoom, playback and browse buttons and a USB jack for uploading video. The original models recorded at a 640x480-pixel resolution; later models featured HD recording at 1280x720 pixels. The Mino was a smaller Flip Video, with the same features as the standard model. The Mino was the smallest of all camcorders, slightly wider than a MiniDV cassette and smaller than most smartphones on the market. In fact the Mino was small enough to fit inside the shell of a VHS cassette. Later HD models featured larger screens. In 2011, the Flip Video (more recently manufactured by Cisco) was discontinued. Interchangeable-lens camcorders can capture HD video with DSLR lenses and an adapter. In 2011, Sony launched its HDR-PJ range of HD camcorders: the HDR-PJ10, 30 and 50. Known as Handycams, they were the first camcorders to incorporate a small image projector on the side of the unit. This feature allows a group of viewers to watch video without a television, a full-size projector or a computer. These camcorders were a huge success and Sony subsequently released further models in this range. Sony's current 2014 line up comprises the HDR-PJ240, HDR-PJ330 (entry level models), HDR-PJ530 (mid-range model) and the HDR-PJ810 (top of the range). Specifications vary by model. Camcorders are used by nearly all electronic media, from electronic-news organizations to current-affairs TV productions. In remote locations, camcorders are useful for initial video acquisition; the video is subsequently transmitted electronically to a studio or production center for broadcast. Scheduled events (such as press conferences), where a video infrastructure is readily available or can be deployed in advance, are still covered by studio-type video cameras "tethered" to production trucks. Camcorders often cover weddings, birthdays, graduations, children's growth and other personal events. The rise of the consumer camcorder during the mid- to late 1980s led to the creation of TV shows such as America's Funniest Home Videos, which showcases homemade video footage. Political protesters use camcorders to film what they believe unjust. Animal rights protesters who break into factory farms and animal testing labs use camcorders to film the conditions in which the animals are living. Anti-hunting protesters film fox hunts. People investigating political crimes use surveillance cameras for evidence-gathering. Activist videos often appear on Indymedia. Police use camcorders to film riots, protests and crowds at sporting events. The film can be used to spot troublemakers, who can then be prosecuted. In countries such as the United States, the use of compact dashcams in police cars allows the police to retain a record of activity in front of the car (such as interaction with a stopped motorist). Camcorders are used in the production of low-budget TV shows if the production crew does not have access to more expensive equipment. Movies have been shot entirely on consumer camcorder equipment (such as The Blair Witch Project, 28 Days Later and Paranormal Activity). Academic filmmaking programs have also switched from 16mm film to digital video in early 2010s, due to the reduced expense and ease of editing of digital media and the increasing scarcity of film stock and equipment. Some camcorder manufacturers cater to this market; Canon and Panasonic support 24p (24 fps, progressive scan—the same frame rate as cinema film) video in some high-end models for easy film conversion. Schools in the developed world increasingly use digital media and digital education. Students use camcorders to record video diaries, make short films and develop multi-media projects across subject boundaries. Teacher evaluation involves a teacher's classroom lessons being recorded for review by officials, especially for questions of teacher tenure. Student camcorder-created material and other digital technology are used in new-teacher preparation courses. The University of Oxford Department of Education PGCE programme and NYU's Steinhardt School's Department of Teaching and Learning MAT programme are examples. The USC Rossier School of Education goes further, insisting that all students purchase their own camcorder (or similar) as a prerequisite to their MAT education programs (many of which are delivered online). These programs employ a modified version of Adobe Connect to deliver the courses. Recordings of MAT student work are posted on USC's web portal for evaluation by faculty as if they were present in class. Camcorders have allowed USC to decentralize its teacher preparation from Southern California to most American states and abroad; this has increased the number of teachers it can train. Quadruplex videotape (1955): Developed formally by Ampex, this was the recording standard for 20 years. Vision electronic recording apparatus (Vera) (1955): An experimental recording standard developed by the BBC, it was never used or sold commercially. VHS-C (1982): Originally designed for portable VCRs, this standard was later adapted for compact consumer camcorders; identical in quality to VHS; cassettes play in VHS VCRs with an adapter. Still available in the low-end consumer market. Relatively short running time compared to other formats. DV (1995): Initially developed by Sony, the DV standard became the most widespread standard-definition digital camcorder technology for the next decade. The DV format was the first to make capturing footage for video editing possible without special hardware, using the 4- or 6-pin Firewire sockets common on computers at the time. DVCPRO (1995): Panasonic released its own variant of the DV format for broadcast news-gathering. DVD recordable (1996): A variety of recordable optical disc standards were released by multiple manufacturers during the 1990s and 2000s, of which DVD-RAM was the first. The most common in camcorders was MiniDVD-R, which used recordable 8 cm discs holding 30 minutes of MPEG video. D-VHS (1998): JVC's VHS tape supporting 720p/1080i HD; many units also supported IEEE 1394 recording. Digital8 (1999): Uses Hi8 tapes; most can read older Video8 and Hi8 analog tapes. MICROMV (2001): Matchbox-sized cassette. Sony was the only electronics manufacturer for this format, and editing software was proprietary to Sony and only available on Microsoft Windows; however, open source programmers did manage to create capture software for Linux. MPEG-2 codec-based format: Records MPEG-2 program stream or MPEG-2 transport stream to various kinds of tapeless standard and HD media (hard disks, solid-state memory, etc.). Since most manufacturers focus their support on Windows and Mac users, users of other operating systems have difficulty finding support for their devices. However, open-source products such as Kdenlive, Cinelerra and Kino (written for the Linux operating system) allow editing of most popular digital formats on alternative operating systems and can be used in conjunction with OBS for online broadcast solutions; software to edit DV streams is available on most platforms. The issue of digital-camcorder forensics to recover data (e.g. video files with timestamps) has been addressed. USB streaming and USB port. ^ "Britannica online encyclopedia: camcamcorder". Archived from the original on 2009-12-10. Retrieved 2008-08-05. ^ a b "Separate camera and recorder; First VHS-C camcorder". 2007-09-14. Archived from the original on 2008-10-16. Retrieved 2007-09-14. ^ Seth Barton (January 9, 2014). "Sony FDR-AX100 review - Hands on with first consumer 4K camcorder". Archived from the original on January 13, 2014. ^ "4K Camcorder - Portable Video Camera - FDR-AX100 - Sony UK". Sony UK. Archived from the original on March 17, 2014. Retrieved March 17, 2014. ^ Dan Chung. "B+H give first look at Panasonic HC-X1000 4K Camcorder". Archived from the original on December 27, 2014. Retrieved December 27, 2014. ^ Snow, Christopher (January 9, 2012). "Sony reveals Spring Handycam lineup, including CX760V, XR260V, and CX190". Reviewed.com Camcorders. Retrieved October 22, 2013. ^ "Videotape Life Expectancy". Video Tape Discussion. Archived from the original on February 5, 2013. Retrieved October 22, 2013. ^ McCabe, Liam F. (January 7, 2013). "Sony Launches Six New Entry-Level Camcorders for 2013". Reviewed.com Camcorders. Retrieved October 22, 2003. ^ Pogue, David (September 20, 2007). "Beware the tapeless camcorder". The New York Times. Archived from the original on November 29, 2016. ^ "Kodak PlaySport Zx5 Review". July 19, 2006. Archived from the original on January 17, 2012. ^ Reardon, Marguerite (April 13, 2011). "Why Cisco killed the Flip mini camcorder". CNET. Archived from the original on October 25, 2013. Retrieved October 22, 2013. ^ "Sony NEX-VG10: An HD Camcorder With DSLR Brains". August 13, 2011. Archived from the original on September 8, 2012. ^ "Handycam HD camcorder with built in projector: Sony". November 1, 2011. Archived from the original on April 5, 2012. ^ Dennedy, Dan (August 2, 2003). "MicrMV capture". Kino Video Editor. Archived from the original on February 22, 2012. Retrieved October 23, 2013. ^ Ariffin, Aswami; Choo, Kim-Kwang Raymond; Slay, Jill. Thomborson, C.; Parampalli, U. (eds.). "Digital Camcorder Forensics" (PDF). Conferences in Research and Practice in Information Technology. 138. Archived (PDF) from the original on October 23, 2013. Retrieved October 22, 2013. Wikimedia Commons has media related to Camcorders. Look up camcorder in Wiktionary, the free dictionary.